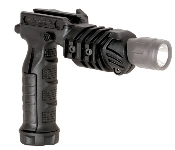 Flashlight Grip Adapter combines a 1"-1.08" light mount and vertical grip in one. Thumb activated push button on grip operates lights on/off switch and allows for signaling. Removable side plates utilize a rubber surface to enable installation of a pressure switch underneath side plate. Plugged storage and Picatinny rails on light mount. Pat. Pending Flashlight Grip Adapter combines a 1" light mount and vertical grip in one. Removable side plates utilize a rubber surface to enable installation of a pressure switch underneath side plate. Plugged storage and Picatinny rails on light mount. Pat. Pending. NTOA (National Tactical Officers Association) tested and recommended.